Shaun Barger is a Los Angeles-based novelist who detests cold weather, idiot plotting, and fascism. He splits his days between writing, resisting the siren’s call of Hollywood’s eternally mild summer climes, and appeasing a tyrannical three-pound Chihuahua with peanut butter and apple slices. 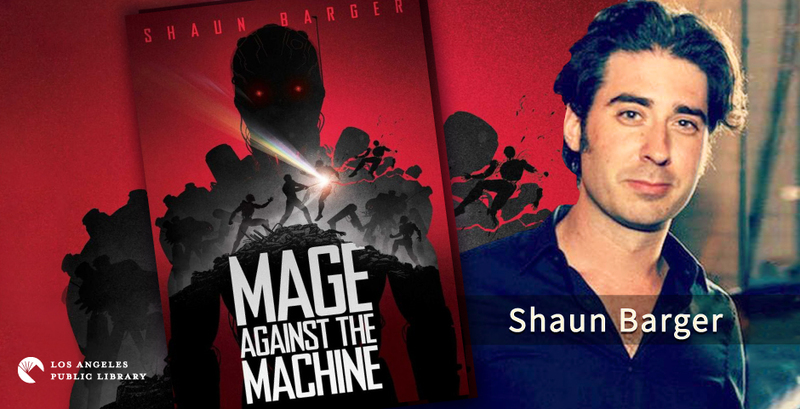 Mage Against the Machine is his first novel and he recently agreed to be interviewed by Daryl Maxwell for the LAPL Blog. What was the inspiration for Mage Against The Machine? Mage Against the Machine was the book I always wanted, that hadn’t yet been written. I wanted wizards who were messy, and human. I wanted a robot apocalypse that made sense, and felt real. I wanted complex AI villains who felt more like weird synthetic gods than mindless monsters made of metal. I wanted these worlds to meet, and I wanted it to make sense. Mage Against The Machine is an incredible title! Is there a story/occurrence behind it? Thank you! My kid sister Caitlin Barger came up with it, actually. She’s been an editor and cheerleader for my writing since we were kids. Running a high fever while we were at a house party, she shouted the title at me from across a loud room full of our drunken friends. “Mage Against the Machine!” I’d begun work on the first version of the book back then in 2011 but hadn’t thought of a title I loved yet. I heard her feverishly shouted suggestion and was like uh, yeah. Done. You’re a genius, sis. Anyone reading this will now understand the dedication. Don’t be surprised if you see Caitlin’s books on the shelf in the not-so-distant future. She’s been working on this literary apocalypse novel for a while now, and it’s absolutely killer. Publishers are going to Thunderdome over it. How did the novel evolve and change as you wrote and revised it? Are there any characters or scenes that were lost in the process that you wish had made it to the published version? I’ve thrown away hundreds of pages of this, across 8 or 9 really distinct drafts. The book you can buy is almost completely different from the original version, but for one chapter, and a few scattered moments. Mage Against the Machine is a book I always wanted, but couldn’t find, so I had to write it. It was a LOT of work, but I took my time with it. I’m sure there are still some holes in the illusion here and there, but overall I think the seams are pretty well hidden. Are Nikolai, Jem, or any of the other characters inspired by or based on specific individuals? The character of Dr. Elizabeth Blackwell is an homage to the real-life person of the same name, who was the first woman to earn a Medical Degree in the United States. She was awesome, and more people should know about her. The Magus, by John Fowles; Killing Commendatore, by Haruki Murakami; The Story of a New Name, by Elena Ferrante; Mossflower, by Brian Jacques; Sing, Unburied, Sing, by Jesmyn Ward. The Once and Future King, by T.H. White. My dad read it to me and my sis. The first arc, at least. It gets kind of adult after the sword in the stone part. Was there a book you felt you needed to hide from your parents? Novels, no, but lots of comic books I knew they’d think I was too young for. I was really into Vertigo Comics, especially John Ney Rieber’s masterful Books of Magic series. It would get really adult, really intense and heavy, sometimes. But adults underestimate what kids can handle. Kids pick up on and understand way more than they get credit for. The Great Gatsby. As a teen, I found all the horrible, idiotic rich people so intolerable that I couldn’t get through it. I revisited the novel later in life, though, and it’s now one of my favs. Can you name a book you've bought for the cover? The 1st edition hardcover of Stephen King’s The Stand. Every book changes us a little. I think the psychological benefits of reading are shockingly profound and criminally unsung. Reading fiction, when regular and sustained, is a form of meditation that develops your capacity for empathy. That’s amazing! Meditation has always been very challenging for me. Reading, less so. Most of the time, at least. So as not to totally dodge the question: The Hobbit, by J.R.R. Tolkien, was the first novel that I read on my own as a child, triggering a voracious thirst for adventure across every genre that has yet to be fully quenched. The History of Love by Nicole Krauss is the book I always give as a gift, inevitably leading to a tearful call upon completion, telling me how beautiful it was. The History of Love is a masterpiece. Read it. Is there a book you would most want to read again for the first time? I don’t think people who missed out on the initial Harry Potter phenomenon realize how uniquely amazing it was. I was a teenager when Order Of The Phoenix came out. I was on vacation with my family, camping on Catalina. There was a midnight release party at a candy store on the boardwalk. When the store opened, everyone poured out of the nearby bars and clubs, joining the camper families who’d ventured down for the event. When you bought a book, you were given a complimentary butterbeer that the candy store had made from scratch. It was the best interpretation of butterbeer I’ve ever had: 1 scoop of spiced vanilla ice cream, dropped into a cup of hot mulled cider. They served it right away, just as the ice cream began to melt. It was cold on the beach. And the butterbeer was perfect. Flashlights glowed from inside tents across the campground as the returning families stayed up late, reading. The next day, the vibrant blue Harry Potter books dotted the beach and boardwalk, as everyone seemed to be reading a copy. The book, plus the experience of it all—it was just so perfect! I wish I could experience something like that again. A vast, shared experience, based around a book. Baseball on the moon with Benjamin Sisko! Work on the sequel to Mage Against the Machine, titled Good Kid, Mage City, is well underway! After that, I’ll be completing this supernatural horror Hollywood noir I’ve been picking away at for the past few years. Kind of Big Trouble in Little China meets House of Leaves. It’s called Glitz: Neon Hollywood Wonderland, and I can’t wait to share it with ya’ll!